Happy Presidents’ Day! Winter recess starts this week. It’s a great time to take off from work and spend extra quality time with your children. This week is filled with bridge building, culinary sing-a-long activities, space food, puppies, beat boxing, glass slippers, Elmo and a life-sized maze. There is definitely a lot to choose from. So without further adieu, here are our picks for the week ahead. Kids Week is back at the Intrepid Museum. During winter recess, children of all ages will get to experience a variety of activities that focus on aviation and space. The week is filled with storybook readings, science experiments and DIY activities, demonstrations from a Master Falconer and other builder activities. Some activities include the physics of making the perfect paper airplane, growing food in outer space, a pop-up planetarium and a DIY telescope activity. Every day has a different theme. So check out the Intrepid’s website for a full list of activities. Ticket prices start at $10 for children 3-6. The New York Botanical Garden is kicking off a week of culinary activities for kids on Feb 16. The week is hosted by celebrity chef, Carla Hall, of ABC’s “The Chew.” The week will be filled with interactive activities, workshops and a tropical treasure hunt. It’s a great time to learn about plant life as well as to offer your kids a few lifelong skills. Kids will learn how to grow and prepare herbs, fruits and vegetables. They will also learn a few kitchen folksongs through an interactive sing-a-long. This will surely be a toe-tapping and edible good time. Ticket prices start at $10. There is no denying the explosion of pet lovers in New York City. But with so many dogs and cats to choose from, how do you decide which one to bring home? Well, you can take your kids to the Westminster Kennel 139th Annual Dog Show on February 16 and 17 to see some of the unique breeds of dogs out there. This is an all day event. Between 8 am and 6 pm there will be breed judging and junior showmanship preliminaries at Chelsea Piers 92/94. The evening sessions take place from 6 pm to 11 pm at Madison Square Garden. If you go, don’t forget to tweet us pics of your favorite dogs! One of the great things about the first few months of the year is that New Year celebrations never really stop. As New Yorkers, we love to experience the traditions of other cultures. On Sunday, February 22, the Rubin Museum of Art will host Losar, the Himalayan New Year. Families will have a chance to enjoy traditional Tibetan music performances throughout the day, sip Himalayan butter tea and enjoy live artist demonstrations. If you haven’t seen a sand mandala created from scratch, then now is the time. You can also take your kids to contribute to a giant collaborative mandala. There will also be plenty of other arts and craft activities and food to enjoy. Tickets cost $10 for kids. Adults pay the regular price of admission. The New York Hall Of Science is celebrating winter recess with a special Engineering Week for kids. The week highlights numerous educational opportunities, related to civil, electrical and mechanical engineering. The week runs from February 16 to 20. Monday is packed with some really cool activities thanks to the American Society of Civil Engineers. Kids will learn to make several types of bridges and other structures out of a variety of materials, such as gumdrops, toothpicks, aluminum foil, paper and wooden dowels. The week also hosts activities related to nano engineering, wearable devices, and motors. Learning a musical instrument is one of the great joys in life. But can you turn yourself into a human instrument? On Saturday, February 21, Kid Lucky and Kaila Mulady will deliver a special Beat Box workshop at La Mama’s Ellen Stewart Theatre. These two artists combine hip-hop beats, funk, jazz and rock with song and poetry to create dazzling vocal performances. Tickets to the workshop cost $5 and it starts at 11 am. Every child should have a chance to visit Sesame Street, right? Starting Thursday, February 19, Sesame Street Live: Make a New Friend comes to Madison Square Garden. The event focuses on Elmo, Grover and Abby Cadabby. They will be welcoming Grover’s friend Chamki, who has traveled all the way from India to visit her friends at Sesame Street. This will surely be a great event, filled with lots of singing, dancing and cultural sharing. The event also features premium tickets, called Sunny Seats. If you purchase these, you will get the chance to hang out with the folks from Sesame Street before the show and take pictures. Ticket prices range from $15 to $145. The Player’s Theater will be hosting the kind of kids’ show I love. It’s Cinderella the musical. However, that’s not the main reason that I like it. The Player’s Theater has set up a two-hour program. In the first hour, families will participate in a free interactive arts workshop. They will learn about the book and how it was turned into a musical. Then, kids get to make their own crowns and magic wands and head off to watch the musical. It’s a great way to help kids understand the magic behind the “magic” they see on stage. Ticket prices range from $25 to $45. Shows are on Saturdays at 2 pm (Workshop at 1 pm) and Sundays at 11 am (Workshop at 10 am). On Sunday, February 22, The New York Transit Museum’s13th Annual Holiday Train Show will come to a close at Grand Central. This is your last chance to get a birds-eye view of NYC’s transit system until the holiday season returns in November. 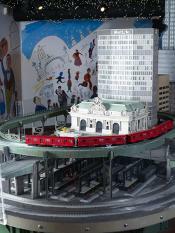 You will get to see the New York Central, Metro-North and subway trains and depart from a mini Grand Central Terminal. The exhibit is open every day this week. Sunday, February 22, will be your last chance to check out the Wild Medicine in the Tropics exhibit at the New York Botanical Garden. This is a great new exhibit for the little doctor or doctor in your family. Kids will learn about the importance of the earth’s rainforest as well as many plant and tree species that help with health and wellness. This is also great exhibit for kids in the Scouts to take in. What child wouldn’t want the chance to navigate her or his way through a life-sized maze? This Sunday, February 22, will also be your last chance to take your kids to the Jewish Children’s Museum and experience A-MAZE 'n Shabbos. This is a fun game and educational activity rolled into one. 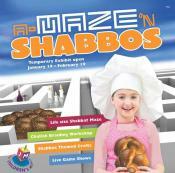 The Shabbat-themed maze features word and picture puzzles as well as historical lessons on traditional Challah bread. Plus, you’re in a life-sized maze! Did I say that already? Kids will also be able to don their chef hat and learn unique braiding techniques in making Challah bread. The Enlace S.C. troupe from The Canary Islands and Barcelona, Spain will host its last performance at the New Victory Theatre also on Sunday, February 22. The troupe’s Cambuyon show mixes African, Irish, Spanish and American beats into one energetic performance. This group has a knack for making music out of everyday items, such as wooden crates and glass bottles. If you enjoy watching musicians on the subway who transform plastic pales into drums, then you’ll definitely enjoy this. It is 60 minutes without intermission. Ticket prices start at $15.